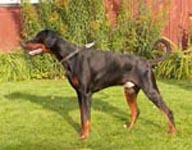 Bouth parents is from litters there all is free on eyes and with hips A & B. In bouth litters there are two dogs who has passed tests for police/military work and high points at mental test. 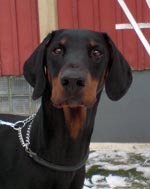 Calypso Capar is a young male who has passed the L-test for Swedish police and guard dogs. He has also passed the test for working as a passport dog. 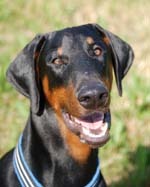 L-test as passport dog, 20 mounth old: Friendly and kind, big chase-following, big grabbing, medium fighting spirit, good temperament, small sharpness, small defending spirit, nerves fast, medium hard, big social stability, stabil social stability, not tested at gunshots. L-test police 21 mounth old: open and friendly in social kontact, medium fighting spirit, good temperament, very small sharpness, small defending spirit, medium nerves, not so mutch hardness, medium courage, ok at gunshots. Good to use as policedog, guard dog. 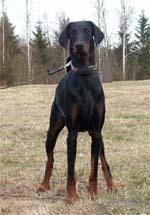 He is korad 3½ year old with the parts 3, -2, 3, 2, 1, 1, 1, 3, -1, ok at gunshots, totally 128 points. 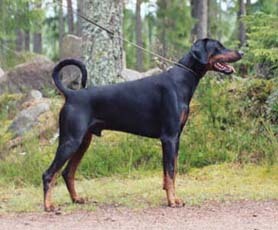 His sister Cimberly work as military dog in the Swedish army. 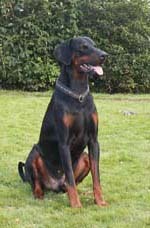 Cimberly was the highest tested dog of those the army tested that year she was bouhgt by the army. Another sister Catalin have passed the Swedish korning with 221 points. Of the 6 in the litter 3 have A on their hips, and 2 B. One is not x-rayed. All where free on their eyes. 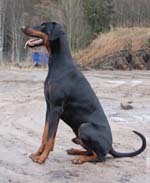 When we choose Capar we wanted a Swedish mentality good male from a good litter with some new blood.Capar himself is a very social and kind male male with mutch working spirit and a good bite. He is free on his eyes, and have HD B Read more about Calypsos brothers and sisters at kennel Oncemore. 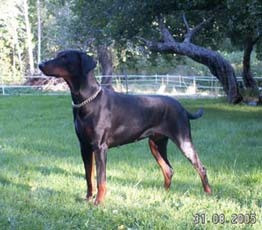 Busan is a young female who had started to compete during 2004. 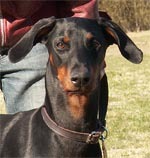 She has passed beginners class tracking in our Swedish working dog trials. Busan train our Swedish protection. Busan has doned the Swedish korning with good score and the result of the different parts is 3 3 2 3 1 1 2 3 1 ok at gunshots, totaly 223 points. Her brother Bonus has passed the test for Norwegian police dogs, compete in elit class tracking and has passed the Swedish korning with 180 points. 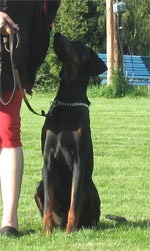 Another brother Buster has passed the test with 247 points and compete in low class tracking and protection. Her sister Bellis has also has passed the Swedish korning with 148 points. Of the 9 in the litter 3 have A on ther hips, the rest of them B. All is free on their eyes. At Busans female line there is 4 generations of working females who also have been honored the Swedish Working dog club's prize for korade offsprings. 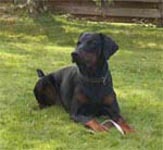 Read more about Busans brothers and sisters at kennel Twin-Q's. We hope that this litter can give us steady dogs who can be used as military, police, guarg dogs as well as sport dogs. 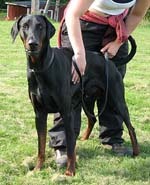 The breeding is on Baron Bryan von Harro's Berg 5-5,5, Hertog Alpha v. Le Dobry 5-5-5 och Jaque von Roveline 4,5.